What Day Of The Week Was March 12? 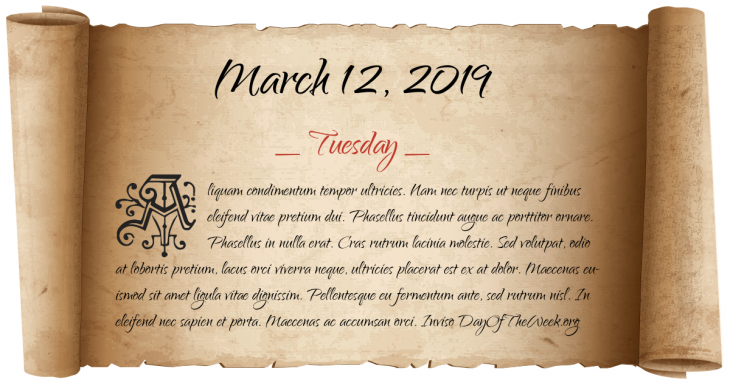 March 12, 2019 was the 71st day of the year 2019 in the Gregorian calendar. There were 294 days remaining until the end of the year. The day of the week was Tuesday. Peninsular War: A day after a successful rear guard action, French Marshal Michel Ney once again successfully delayed the pursuing Anglo-Portuguese force at the Battle of Redinha. Mahatma Gandhi leads a 200-mile march, known as the Salt March, to the sea in defiance of British opposition, to protest the British monopoly on salt. New Hampshire Lottery: New Hampshire becomes the first U.S. state to legally sell lottery tickets in the 20th century. North Korea nuclear weapons program: North Korea says that it plans to withdraw from the Nuclear Nonproliferation Treaty and refuses to allow inspectors access to its nuclear sites. The Blizzard of 1993 – Snow begins to fall across the eastern portion of the US with tornadoes, thunder snow storms, high winds and record low temperatures. The storm lasts for 30 hours. Financier Bernard Madoff plead guilty in New York to scamming $18 billion, the largest in Wall Street history. Who were born on March 12?